Adams stackable and stylish Low-Back chair is perfect for the porch, patio or deck. UV protected to prevent color fading. The Low-Back chair is proudly made in the USA out of high quality molded resin for hassle-free maintenance and all weather performance. Resin base. Resin base. Resin base. Ideal for use as an accent table for dorm rooms, apartments, patio or pool, laptops, books, snacks and more. Folds flat quickly and easily for out of the way storage. Weighs only 3 lbs and easily supports up to 25 lbs. UV protected to keep colors bright. Made of 100% polypropylene. Made in USA. Dimensions: 19.75"H x 15.25"W x 17.375"D.
Seasonal Trends Relaxer Chair, 44 in Overall Height, 25.59 in Overall Width, 63-3/4 in Overall Depth, 21 in Arm Height, 250 lb Load Capacity, Steel, Blue A classic design sized for the comfort of little ones. Stackable and weather-resistant kid Adirondack is ideal for the backyard and patio area. UV-protected to prevent color fading. Manufactured in the USA out of high quality molded resin for hassle-free maintenance and all-weather performance. Easy to clean and store. Passes ASTM testing for residential use. Relax poolside and bask in the sun in this sturdy and adjustable resin chaise. Impervious to salt and other corrosives. Delivers long lasting value along with all-weather performance. Tested to ASTM residential standards. Adjusts to four comfortable positions. Includes wheels for easy movement. Easy to clean and store. Rated to hold 250 lbs. Ideal for poolside, decks and the beach. Four positions, includes wheels. Dimensions: 76.25'' x 27'' x 17.5''. Made in the U.S.A.
A classic design sized for the comfort of little ones. Stackable and weather-resistant kid Adirondack is ideal for the backyard and patio area. UV-protected to prevent color fading. Manufactured in the USA out of high quality molded resin for hassle-free maintenance and all-weather performance. Easy to clean and store. Passes ASTM testing for residential use. A classic design sized for the comfort of little ones. Stackable and weather-resistant kid Adirondack is ideal for the backyard and patio area. UV-protected to prevent color fading. Manufactured in the USA out of high quality molded resin for hassle-free maintenance and all-weather performance. Easy to clean and store. Passes ASTM testing for residential use. A classic design sized for the comfort of little ones. Stackable and weather-resistant kid Adirondack is ideal for the backyard and patio area. UV-protected to prevent color fading. Manufactured in the USA out of high quality molded resin for hassle-free maintenance and all-weather performance. Easy to clean and store. Passes ASTM testing for residential use. Stackable and sturdy ottoman complements the Adirondack chairs. Keeps your legs resting comfortably while sitting. Ideal for decks, patios, porches, sunrooms and backyards. Made of 100 percent polypropylene. Dimensions: 13.75"H x 20"W x 21"D. Ottoman weighs only 3.77 lbs. Seasonal Trends Dining Chair, 94.49 in Overall Height, 25.59 in Overall Width, 40.16 in Overall Depth Ideal for use as an accent table for dorm rooms, apartments, patio or pool, laptops, books, snacks and more. Folds flat quickly and easily for out of the way storage. Weighs only 3 lbs and easily supports up to 25 lbs. UV protected to keep colors bright. Made of 100% polypropylene. Made in USA. Dimensions: 19.75"H x 15.25"W x 17.375"D.
Crank umbrella for market use. Includes 9 ft. steel pole Crank umbrella for market use. Includes 9 ft. steel pole Solid, dependable side table is the ideal size for the deck or patio. UV protected to prevent fading. High quality colorfast resin. Dimensions: 16'' x 16'' x 15.75''. Made in U.S.A.
Made from the same pine and fir as our rockers, this table has the solid construction and quality you deserve. A unique curing process helps extend the life of the wood by preventing mold and mildew, insect infestation and rendering them fire resistant. Each is then log individually cut, milled, charred, hand polished and sealed with a clear coat of varnish. All the logs are pre-checked to prevent cracking from expansion and construction of the wood. Dimensions: 24"L x 20.5"W x 18.1"H. Weighs 19.8 lbs. For patios and decks. Strong enough to hold up to 250 lbs. Meets ASTM standard for residential use. Dimensions: 22'' x 20'' x 31''. Made in U.S.A. For patios and decks. Strong enough to hold up to 250 lbs. Meets ASTM standard for residential use. Dimensions: 22.5'' x 22'' x 36''. Made in U.S.A.
Worldwide Sourcing Adirondack Chair, 36-3/4 in Overall Height, 5-1/4 in Overall Width, 20-1/2 in Overall Depth, Natural Stackable and stylish high back chair. Ideal for the pool, deck patio etc. Easy to clean and store. Weight capacity 250 lbs. RealComfort incorporates innovative lumbar and neck support which promotes a restful back angle. Flex-cushion and softer support beams into the seating area to further enhance comfort. Safety grip foot design for more stability. Generously sized to fit everyone. UV protected to keep colors bright season after season. Made of 100 percent polypropylene and made in USA. Rated to hold up to 250 lbs. Dimensions: 37.5"H x 30"W x 32.5"D.
For patios and decks. Strong enough to hold up to 250 lbs. Meets ASTM standard for residential use. Dimensions: 22.5'' x 22'' x 36''. Made in U.S.A. RealComfort incorporates innovative lumbar and neck support which promotes a restful back angle. Flex-cushion and softer support beams into the seating area to further enhance comfort. Safety grip foot design for more stability. Generously sized to fit everyone. UV protected to keep colors bright season after season. Made of 100 percent polypropylene and made in USA. Rated to hold up to 250 lbs. Dimensions: 37.5"H x 30"W x 32.5"D. RealComfort incorporates innovative lumbar and neck support which promotes a restful back angle. Flex-cushion and softer support beams into the seating area to further enhance comfort. Safety grip foot design for more stability. Generously sized to fit everyone. UV protected to keep colors bright season after season. Made of 100 percent polypropylene and made in USA. Rated to hold up to 250 lbs. Dimensions: 37.5"H x 30"W x 32.5"D.
Traditional porch swing seat. Includes chain hanging kit. 9' aluminum tilt/crank umbrella features powder-coated aluminum pole, 8-steel powder-coated ribs and 180-gram polyester fabric with vent. Folding Bistro Table, Round Shape, 27 in Diameter, Glass Big Easy designed for long lasting comfort. Ideal for decks, patios, porches and sunrooms. 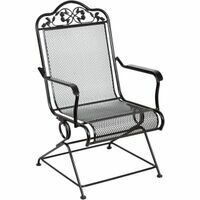 Curved seat and comfortable back support delivers relaxation while incorporating a smooth and peaceful rocking action. Easy to maintain. Built from high-quality resin for all-weather performance. Made of 100 percent polypropylene. Chair weighs only 13.30 lbs. Holds up to 350 lbs. Dimensions: 41.0"H x 29.62"W x 36.9"D.
RIO Furniture Umbrella, Outdoor, Blue Fabric, 4 ft Pole Height, Clamp-On Umbrella, For Outdoor Use 24.5 x 29.5 x 37 in. Square table, Tan Oxford fabric, black steel frame. Pre-treated and powder coated to prevent rusting, No assembly required. Square table, Tan Oxford fabric, black steel frame. Pre-treated and powder coated to prevent rusting, No assembly required. This rustic chair features a natural wood grain finish, curved seat slats, as well as rounded armrests for maximum comfort. A unique curing process helps extend the life of the wood by preventing mold, mildew and insect infestation. Each is then log individually cut, milled, hand polished and sealed with a clear coat of varnish. All the logs are pre-checked to prevent cracking from expansion and contraction of wood. Dimensions: 35.43"L x 29.52"W x 44.5"H. Weighs 37.8lbs. Supersized Adirondack chair delivers the ultimate in oversized comfort and quality. Incorporates larger overall proportions, a retractable cup holder and a more vertically upright ergonomic back design that makes getting in and out of the chair completely effortless. Made from high quality weather-resistant resin. Stacking design is easy to clean, maintain and store. UV protected to prevent fading. Seasonal Trends Sling Chaise Lounge, 97.64 in Overall Height, 30.31 in Overall Width, 74.8 in Overall Depth Jack Post Bench, Double Glider, Country Garden Patio Shape, 36-3/4 in Overall Height, 75-1/4 in Overall Width, 35-1/2 in Overall Depth, Steel Frame, Bronze, For Residential Use Comfortably seats four. The ideal shape and size for tight corners or small balconies, the 36" square table is the perfect basic table for any outdoor use. The table legs conveniently and securely snap in underneath for quick and easy storage at the end of the season. Proudly crafted in the USA out of high quality molded resin for hassle-free maintenance and all-weather performance. Easy to clean and store. UV protected to prevent fading. RIO Portable Sun Shelter Aloha Beach Chair, Steel, Assorted This rustic chair features a naturally charred finish, curved seat slats, as well as rounded armrests for maximum comfort. A unique curing process helps extend the life of the wood by preventing mold, mildew and insect infestation. Each is then log individually cut, milled, charred, hand polished and sealed with a clear coat of varnish. Al the logs are pre-checked to prevent cracking from expansion and contraction of the wood. Dimensions: 35.43"L x 29.52"W x 44.5"H. Weighs 37.8 lbs. Aloha Sun Chair, Heavy Duty, Steel Frame RIO Web Chair, 190 lb Load Capacity, Steel Frame, Powder-Coated 11' umbrella. The logs that make up the pyramid base go through a unique curing process which helps extend the life of the wood by preventing mold, mildew and insect infestation. Each is then log individually cut, milled, charred, hand polished and sealed with a clear coat of varnish. The galvanized steel head is fully operational with sealed ball bearings and greased zerks. The blades and tail feature classic red tips Dimensions: 38"L x 38"W x 108"H. Weighs 57 lbs. Superior strength and durability. Folds flat for storage. Stain resistant and easy to clean. Umbrella hole ready. 72'' x 30'' polyethylene wood grain brown color tabletop. Some assembly required. Seats 8 people. Seasonal Trends Lawn Chair, 30.31 in Overall Height, 13.39 in Overall Width, 25.98 in Overall Depth, 5 Positions, Aluminum Frame, 600D Polyester Fabric Dining Table, 60 in Overall Width, 38 in Overall Height, Steel, Slat Extremely strong, cool, soft and breathable nylon fabric. 108'' x 50'' wide comfortable lounging. Max load limit 220 pounds. Easily packs into its own carrying bag. The total length of 12', makes it suitable to hang on trees from 8' to 10'. Fits trees of 4'' in diameter or less. Seasonal Trends Sling Riviera Folding Chair, 24.21 in Overall Height, 15.35 in Overall Width, 33.46 in Overall Depth The Hardwood Bar Stools come in a set of two and are easily assembled. For use with your island, fire table, bar or other outdoor furniture. This set consists of right side arm chair, corner piece, left side arm chair and wicker table with glass top. Westford Collection is constructed durablepowder coated steel, comfortable polyester cushions and woven wicker. Includes accent pillows.